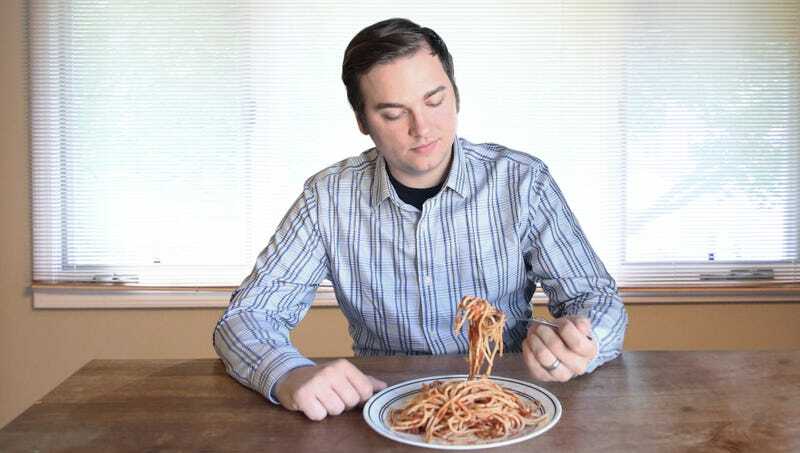 MCKINNEY, TX—In a practice designed to prepare him for the unpredictability of life in general, systems analyst Anthony Cochrane, 29, has consumed multiple servings of spaghetti, mashed potatoes, corn on the cob, toast, doughnuts, snack crackers, and garlic bread so far this week, a nutrition regimen he pursues “just to be safe.” “I try and keep my kitchen constantly stocked with bagels, pasta, English muffins, cereal, corn muffins, rice, white bread, sourdough, French bread, and maybe a loaf of rye, because one really never knows when they’ll be expected to run a half-marathon or a charity 5K,” said Cochrane, using bean dip to adhere a second tortilla wrap to his routine midnight burrito, which provides a much-needed source of glycogen on impromptu sunrise hikes or long-distance 6 a.m. bicycle treks. “Sugars and starches might be unhealthy for sedentary types, but you don’t want to be stuck with low energy in a spur-of-the-moment 400-meter match race or rock climbing expedition. That’s why I always ‘top up’ with yogurt, chips, and Clif bars between the four courses of my breakfasts, my sandwiches at lunch, and the chicken parm and pot pie at dinner.” At press time, Cochrane was observed vomiting up a high-carbohydrate melange of noodle casserole, french fries, and baked yams roughly 200 meters into a charity fun run.